Objectives: To determine the effect of regular prophylactic inhaled corticosteroids on wheezing episodes associated with viral infection in school age children. Design: Randomised, double blind, placebo controlled trial. Setting: Community based study in Southampton. Subjects: 104 children aged 7 to 9 years who had had wheezing in association with symptoms of upper and lower respiratory tract infection in the preceding 12 months. Interventions: After a run in period of 2–6 weeks children were randomly allocated twice daily inhaled beclomethasone dipropionate 200 μg or placebo through a Diskhaler for 6 months with a wash out period of 2 months. Children were assessed monthly. Main outcome measures: Forced expiratory volume in 1 second (FEV1); bronchial responsiveness to methacholine (PD20); percentage of days with symptoms of upper and lower respiratory tract infection with frequency, severity, and duration of episodes of upper and lower respiratory symptoms and of reduced peak expiratory flow rate. Results: During the treatment period there was a significant increase in mean FEV1 (1.63 v 1.53 l; adjusted difference 0.09 l (95% confidence interval 0.04 to 0.14); P=0.001) and methacholine PD20 (12.8 v 7.2 μmol/l; adjusted ratio of means 1.7 (1.2 to 2.4); P=0.007) in children receiving beclomethasone dipropionate compared with placebo. There were, however, no significant differences in the percentage of days with symptoms or in the frequency, severity, or duration of episodes of upper or lower respiratory symptoms or of reduced peak expiratory flow rate during the treatment period between the two groups. Conclusions: Although lung function is improved with regular beclomethasone dipropionate 400 μg/day, this treatment offers no clinically significant benefit in school age children with wheezing episodes associated with viral infection. On the basis of previous longitudinal studies, the treatment period was designed to cover the period of maximum wheezing episodes, from the end of the school summer holiday until the following Easter. The children were recruited on the basis of reported symptoms, not on the basis of asthma diagnosed by a doctor. A simple respiratory questionnaire was sent to the parents of 5727 children aged 7 to 9 years in the Southampton area, resulting in 4830 replies (84.3% response). The entry criteria were more stringent than those previously used.3 Children were selected on the basis of having either five or more wheezing episodes or an episode of wheezing lasting for three or more days in the preceding year. Exclusion criteria included severe respiratory disease and use of inhaled or oral corticosteroids. A total of 160 children fulfilled the enrolment criteria, of whom 104 children and their parents agreed to participate. At the onset of the study all children were reported to develop lower respiratory tract symptoms in association with upper respiratory tract infections. On the basis of previous longitudinal studies,2 the study required 112 children to have an 80% power of detecting a difference of one peak expiratory flow episode at the two sided 5% significance level. Atopy was determined by the results of skin prick testing with the allergens Dermatophagoides pteronyssinus, cat fur, and mixed grass; any child with a weal of 3 mm or greater to any allergen was deemed atopic. A diary of respiratory symptoms was recorded daily, with each symptom scored 0 when there were none, 1 when they were mild, 2 when moderate, and 3 when severe. The sum of symptoms of upper respiratory tract infection (blocked nose, runny nose, sore throat, hoarse voice, fever, and watery eyes) constituted a daily score (maximum 18). The sum of symptoms of lower respiratory tract infection (day cough, night cough, day wheeze, night wheeze, and shortness of breath) constituted a daily score (maximum 15). Each morning and evening the highest of three peak expiratory flow rates were recorded. Every month the children were assessed at their local health centre, where the diary cards were collected, drug treatment checked, growth recorded, and lung function (forced expiratory flow in 1 second (FEV1)) measured, including bronchial responsiveness to methacholine (maximum cumulative dose 25.6 μmol).10 After a run in period of 2 to 6 weeks children were randomly allocated in a double blind manner to either beclomethasone dipropionate 200 μg (Allen and Hanbury, Uxbridge) or placebo twice daily as dry powder through a Diskhaler. There was one further assessment 2 months after discontinuing treatment. Compliance with treatment was calculated by counting the used blisters. The cumulative PD20 for methacholine was calculated by interpolation and extrapolation to one doubling dilution. The PD20 is the provocative dose of methacholine that results in a 20% decrease in FEV1 from baseline. Children who did not have a measurable PD20 were assigned the maximum theoretical dose of methacholine. PD20 values were transformed by taking natural logarithms before analysis. FEV1 and log PD20 measures were averaged over the eight assessments during the treatment period to give summary measures of response for each child. The percentages of days with symptoms (score >0) during the pretreatment and treatment periods were calculated for symptoms of upper and lower respiratory tract infection for each child; they were transformed before analysis by adding 1 and taking the natural logarithm. An episode of upper or lower respiratory symptoms was defined as two or more consecutive days with a total upper or lower respiratory score above the child's median score during treatment, preceded by 1 day and followed by 2 days at or below the median, with the maximum score for the episode being greater than or equal to 2 above the median. The frequency of episodes (expressed as a yearly rate), the average severity of episodes (mean maximum score during episodes), and the average duration of episodes (mean length of episodes in days) during treatment were calculated for each child. Morning peak expiratory flow rates were corrected for each child's growth over the course of the study using standard regression equations to estimate the change in peak expiratory flow rate for a given change in height.11 The coefficient of variation of peak expiratory flow rate in the morning was calculated for each child during pretreatment and treatment periods. An episode of reduced peak flow rate was defined as two or more consecutive days with a peak expiratory flow rate less than or equal to the child's 10th centile of peak expiratory flow during treatment, preceded by 1 day above the 10th centile and followed by 2 days at or above the median. The frequency of episodes (expressed as a yearly rate), the average severity of episodes (mean minimum peak expiratory flow during episodes), and the average duration of episodes (mean length of episodes in days during the treatment) during the treatment were calculated for each child. Summary outcome measures were compared between treatment groups using analysis of covariance, with adjustment for pretreatment values. Results are presented as the difference in means with 95% confidence interval. For variables that were logarithmically transformed before analysis, differences were antilogged and can be interpreted as the ratio of geometric means with 95% confidence interval. Summary measures for symptom episodes and episodes of reduced peak expiratory flow (frequency, severity, and duration) were compared between treatment groups using two sample t tests rather than analysis of covariance because not all children had sufficient pretreatment time to measure episodes in this time. The differing effect of treatment between subgroups was tested by fitting a model with an interaction term between treatment and the subgroup variable. Intention to treat analysis was used. Of the 104 children who entered the study, 52 received beclomethasone dipropionate (37 boys, 15 girls) and 52 placebo (36 boys, 16 girls). Ninety four children completed the study, of whom 50 received beclomethasone dipropionate and 44 placebo. Baseline characteristics at study entry and concomitant drug use were similar in each group (table 1). Ten children withdrew from the study (two were taking beclomethasone dipropionate, eight placebo; χ2=2.78, P=0.1). Eight children withdrew within 6 weeks because of difficulties in attending regularly, one child withdrew during the run in period because of unconnected renal failure, and one child withdrew after 3 months. 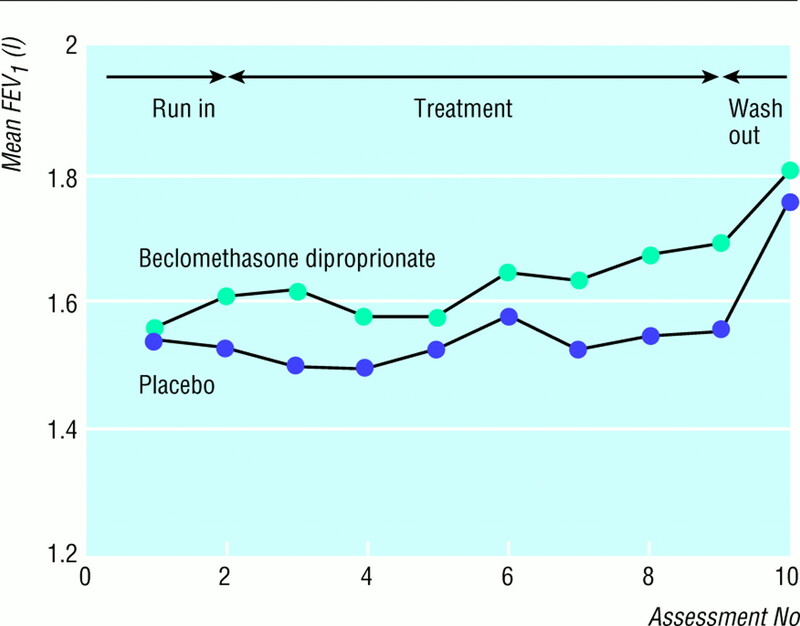 Mean compliance with treatment was similar, being 74.6% in those given beclomethasone dipropionate and 75.9% in those given placebo (difference 1.3% (95% confidence interval −7.5 to 10.2). Three children (one receiving beclomethasone dipropionate and two placebo) were independently prescribed beclomethasone dipropionate by their general practitioner during the course of the study, but they continued to take their assigned study treatment and their results were analysed in their randomised treatment groups. Figure 1 shows changes in FEV1 over the course of the study. Pretreatment mean FEV1 was 1.56 (SD 0.29) l and 1.54 (0.30) l for those taking beclomethasone dipropionate and placebo respectively. During treatment FEV1 was consistently higher in those taking beclomethasone dipropionate, the mean value being 1.63 (0.28) l for beclomethasone dipropionate and 1.53 (0.24) l for placebo. The difference in means (beclomethasone dipropionate minus placebo) adjusted for pretreatment FEV1 was 0.09 (0.04 to 0.14) (t94=3.48, P=0.001). This difference did not persist once treatment was discontinued (mean FEV1 1.81 l with beclomethasone dipropionate v 1.77 l with placebo). Mean FEV1 increased significantly after discontinuing treatment in both the beclomethasone dipropionate (difference compared with mean value during treatment 0.16 l (0.12 to 0.20); t44=7.79, P<0.001) and placebo groups (0.25 l (0.20 to 0.29); t41=10.93, P<0.001). Figure 2 shows the longitudinal changes in methacholine PD20. Pretreatment geometric mean PD20 was 10.2 μmol for beclomethasone dipropionate and 8.5 μmol for placebo. During treatment PD20 was significantly increased in the group given beclomethasone dipropionate compared with that given placebo, the geometric means being 12.8 and 7.2 μmol respectively. 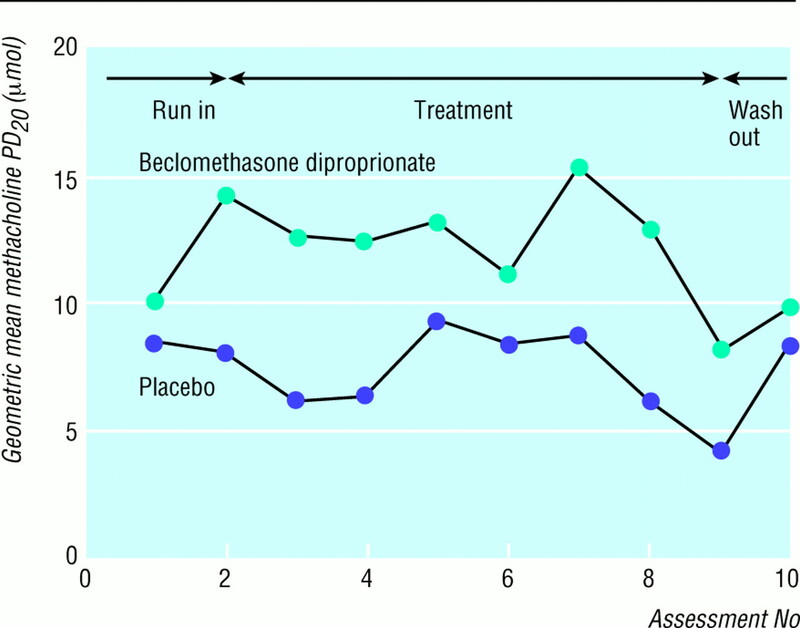 The ratio of geometric means (beclomethasone dipropionate to placebo) adjusted for pretreatment log PD20 was 1.7 (1.2 to 2.4) (t94=2.78, P=0.007). This difference did not persist after discontinuation of treatment (geometric mean PD20 9.8 μmol with beclomethasone dipropionate v 8.3 μmol with placebo). The group given beclomethasone dipropionate had a lower percentage of days with symptoms of upper respiratory tract infection during treatment than did the placebo group (median 10.4% v 15.5%) (table 2), but the difference was not significant. The ratio of geometric means (beclomethasone dipropionate to placebo) adjusted for percentage of pretreatment symptomatic days was 0.66 (0.43 to 1.04) (t91=1.82, P=0.07). There were no significant differences in frequency, severity, and duration of episodes of upper respiratory tract symptoms (table 3). The median percentage of days with symptoms of lower respiratory tract infection during treatment was 15.3% for those given beclomethasone dipropionate and 21.3% for those given placebo (table 4). The ratio of geometric means (beclomethasone dipropionate to placebo) adjusted for percentage of pretreatment symptomatic days was 0.75 (0.53 to 1.07) (t91=1.62, P=0.1). The frequency, severity, and duration of episodes of lower respiratory tract symptoms were similar in both groups (table 5). The mean coefficient of variation in morning peak expiratory flow during treatment was 10.1% for beclomethasone dipropionate and 10.4% for placebo. The difference in means (beclomethasone dipropionate minus placebo) adjusted for the pretreatment coefficient of variation was −0.64 (minus;2.08 to 0.81) (t91=0.87, P=0.4). Median and 10th centile peak expiratory flows were 244.9 and 212.8 l/min in the beclomethasone dipropionate group and 232.1 and 198.3 l/min in the placebo group. All children experienced at least one episode of reduced peak expiratory flow during treatment. The frequency, severity, and duration of episodes of decreased peak flow were similar in the two groups (table 6). There were no significant interactions between treatment and atopy or treatment and asthma for any outcome variable, and the effects of treatment were similar in these subgroups. Although virus studies were not a component of this study, the characteristics, frequency, duration, and magnitude of the episodes had all the features of those reported in a cohort of similar children.3 Although regular inhaled beclomethasone dipropionate significantly improved spirometric results and bronchial responsiveness to methacholine, it had little effect on either frequency, duration, or severity of symptoms of lower respiratory tract infection or on episodes of reduced expiratory flow. These findings argue for a comparatively corticosteroid resistant process underlying virus induced wheezing episodes in susceptible children. Wheezing associated with viral infection has no clear definition, and its diagnosis is based on a history of episodic wheeze in association with infection of the upper respiratory tract and asymptomatic intervals. Although at the onset of the study all children reported respiratory symptoms in association with upper respiratory tract infections, the entry criteria were not specific for wheezing associated with viral infection. Some children had features more suggestive of atopic asthma, and the overlap between wheezing associated with viral infection and atopic asthma may be considerable in this age group. Nevertheless, 95% of children had symptoms of lower respiratory tract infection during treatment. How we defined episodes could potentially obscure the beneficial effects of beclomethasone dipropionate during treatment. If the median symptom score were significantly decreased while receiving beclomethasone dipropionate a lower peak symptom score could potentially register an episode of symptoms. The same would apply for episodes of reduced expiratory flow. However, the median symptom score for upper or lower respiratory tract infection and reduced peak expiratory flow between the two groups were not significantly different. In addition, the severity of episodes was measured as absolute maximum symptom score or absolute minimum peak expiratory flow rather than as changes from the median, so both of these outcomes were not dependent on the median. Thus we feel the use of a similar definition to that used by Johnston et al3 was justified. The FEV1 increased significantly after discontinuing treatment. The children had grown during the study, with a resultant increase in FEV1. Furthermore, the interval between discontinuing treatment and the final assessment was considerably greater than the other intervals, and the assessment was completed during the summer, when respiratory morbidity is at its lowest.3 Nevertheless, we cannot exclude an adverse effect on lung function due to the regular use of a dry powder inhaler, with rebound improvement when the treatment was discontinued. Prophylactic corticosteroids ameliorate the symptoms of experimental viral infections,12 and when they are given systematically at the first sign of symptoms of upper respiratory tract infection the number of days of wheezing, attendances at accident and emergency departments, and hospital admissions decreases significantly.5 In preschool children with recurrent wheeze, however, the therapeutic efficacy of inhaled corticosteroids used either at onset of symptoms6 7 or continuously8 9 has been modest at best, and this study extends their relative ineffectiveness to school age children. Asthmatic children are reportedly more prone than non-asthmatic children to respiratory tract infections,13 while atopic children have more severe symptoms of lower respiratory tract infection and more severe episodes of reduced expiratory flow than non-atopic children.14 In our study we found no benefit from regular treatment with beclomethasone dipropionate when either those children who had been labelled asthmatic or the atopic children were analysed separately. A higher dose of corticosteroid through a superior delivery system might have achieved a greater amelioration of respiratory episodes. Although the Diskhaler is easy to use15 and all children had satisfactory inhaler technique, delivery is not ideal. Nevertheless, drug delivery was sufficient to improve lung function, and we have previously reported decreased growth in those children who received beclomethasone dipropionate compared with placebo,16 as have other investigators.17 Caution should be adopted over the use of inhaled corticosteroids in treating children with mild disease in which episodes of viral infection predominate. Funding: Allen and Hanbury gave financial support for this study and provided the dry powder formulation of beclomethasone dipropionate and placebo.
. Out of the mouths of babes and sucklings: lessons from early childhood asthma. Thorax 1993;48:1200–4.
. Episodes of respiratory morbidity occuring in children with cough and wheeze. Am J Respir Crit Care Med 1994;149:48–53. et al. Community study of role of viral infections in exacerbations of asthma in 9–11 year old children. BMJ 1995;310:1225–8.
. Effects of 22 months of treatment with inhaled corticosteroids and/or beta 2 agonists on lung function, airway responsivness and symptoms in children with asthma. Am Rev Respir Dis 1992;146:547–54.
. Childhood asthma: prevention of attacks with short term corticosteroid treatment of upper respiratory tract infection. Pediatrics 1988;81:624–9.
. Treatment of episodic asthma in preschool children using intermittent high dose inhaled steroids. Arch Dis Child 1990;65:407–10.
. Prevention of viral induced asthma attacks using inhaled budesonide. Arch Dis Child 1993;68:85–7.
. The effects of inhaled beclomethasone dipropionate on lung function and histamine responsiveness in reccurently wheezy infants. Arch Dis Child 1995;73:327–32.
. Rapid method for measurement of bronchial responsiveness. Thorax 1983;38:760.
et al. Lung function in white children aged 4 to 19 years. I. Spirometry. Thorax 1993;48:794–802. et al. A randomized controlled trial of glucocorticoid prophylaxis against experimental rhinovirus infection. J Infect Dis 1990;162:1173–7.
. Viruses as precipitants of asthmatic attacks in children. JAMA 1974;227:292–8.
. The role of asthma and atopy in the susceptibility to respiratory viral infections in children. Am J Respir Crit Care Med 1994:149:A50.
. Patient handling of a multidose dry powder inhalation device for albuterol. Chest 1994;105:1077–81.
. Growth of prepubertal children with mild asthma treated with inhaled beclomethasone dipropionate. Am J Respir Crit Care Med 1995;151:1715–9.
. Aerosol beclomethasone dipropionate compared with theophylline as primary treatment of chronic, mild to moderately severe asthma in children. Pediatrics 1993;92:144–6.